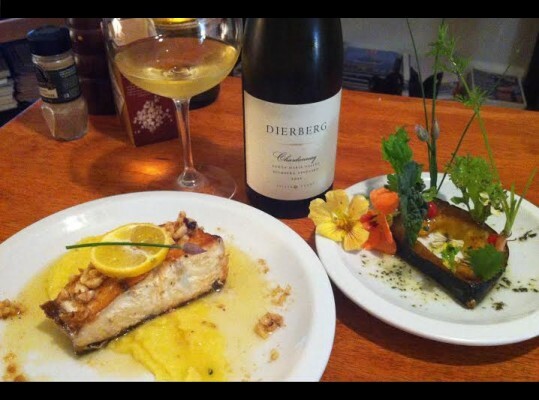 The nutty richness of the dish pulls an elegant sweetness from this crisp Chardonnay. Toasted notes in the wine are enhanced by the subtle hazelnut and lemon. Enjoy this playful and delicious pairing! Clippings of baby greens, veggies, and edible flowers from my garden! Begin by Preheating your oven to 350. Cut your small acorn squash lengthwise. Rub cut sides with olive oil and sprinkle with salt and pepper. Place squash cut side down in a small oven safe dish covered for roughly 20-30 mins. This time will vary depending on the size of the squash- check doneness with a fork after about 15 minutes and continue roasting accordingly. Once squash is done, set aside to cool uncovered. Once cooled, carefully slice a 1/2″ ring per person of squash and reserve for salad. Spoon the remaining squash into a small sauce pan over low heat. Add 2tbsp butter and salt and pepper to taste. Cover and keep warm stirring occasionally. Meanwhile, prepare your fish. Rinse filets and pat dry then sprinkle with salt and pepper. Heat a heavy bottomed pan at med-high heat. Drizzle pan with canola oil to coat the bottom completely. To achieve a crispy skin and no sticking, make sure your pan is hot hot hot. Test readiness by flicking a drop of water into the pan and listen for a prominent sizzle. Place filets skin side down to begin, do not touch them until you are ready to flip them over, about 6 minutes. Carefully flip your filets. After about 3 minutes add 1/2 stick of butter to your fish pan. Add hazelnuts and stir as butter begins to brown, this happens quickly, about 1 minute. Finish with 1/2 a lemon squeezed, stir around filets. Remove from heat. Spoon a smear of squash puree onto each plate and top with a beautiful filet carefully removed from pan. Drizzle your brown butter over the fish and around the plate. I garnished with a slice of lemon and a chive flower from my garden, but that is up to you. My salad was comprised of baby greens, flowers and baby veggies from my own garden, specifically micro arugula and arugula flowers, chives and chive flowers, baby carrot, baby broccoli, nettle, micro celery, baby grape tomatoes, nasturtiums and mustard flowers. As long as it is colorful and fresh it’s a win. I simply inserted each micro green into the reserved ring of squash and drizzled with the vinaigrette.